Management is the process of directing resources in an efficient and effective manner towards the accomplishment of the organizational objectives. It is described as a social process involving responsibility for economical and effective planning and regulation of operation of the organization for the fulfilment of the given purposes. It is a dynamic process consisting of various elements and activities. These activities are different from operative functions like marketing, finance, purchase etc. Rather these activities are common to each and every manger irrespective of his level or status. Various management experts have defined management. Some of the definitions of these experts are given below. Activity of the management is carried out for fulfilling its responsibilities for achievement of the organizational objectives by pursuing different functions of the management. Different management experts have broken down, listed and explained these functions. The number of broken down functions by different management experts varies. Some have listed four, some have listed five and some even more than five. 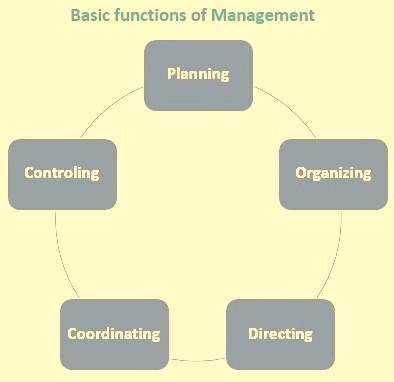 However the basic functions are five (Fig 1) namely (i) planning, (ii) organizing, (iii) directing, (iv) coordinating, and (v) controlling. This breakdown is being accepted by most of the management experts and originally this was listed by Henry Fayol. However he used the word ‘command’ in place of ‘directing’. These five functions are described below. Planning is a basic and the primary function of management which includes formulation of one or more detailed plans to achieve optimum balance of needs or demands with the available resources. It is a dynamic process and very essential for every organisation to achieve their ultimate goals. Planning is the starting point of the whole management process and occupies the first position in the management process. It involves defining a goal and determining the most effective course of action needed to reach that goal. Planning is looking ahead. Drawing up a good plan of action is the hardest of the five functions of the management. This requires an active participation of the entire organization. With respect to time and implementation, planning is to be linked to and coordinated on different levels. Planning is to take the organization’s available resources and flexibility of personnel into consideration to guarantee continuity and to get effective co-ordination, contribution and perfect adjustment. Through this function, management looks ahead and chalks out future course of action to be followed. It is a preparatory step. It is a systematic activity which determines when, how and who is going to perform a specific job. By Planning usually a detailed programme is made regarding future courses of action. Planning is a way to do the things in orderly way, to think before acting and to act in the light of facts rather than guesses. It is deciding of the best alternative among others to perform different managerial functions in order to achieve predetermined goals. It makes possible things to occur which would not otherwise occur. The planning function of the management controls all the planning that allows the organization to run smoothly. It also involves knowledge of the organizational resources and the future objectives of the organization. An organization can only function well if it is well-organized. This means that there must be sufficient capital, staff and raw materials so that the organization can run smoothly and that it can build a good working structure. The organizational structure with a good division of functions and tasks is of crucial importance. Organizing function is an important function of the five functions of the management. Organizing is the function of management which follows planning. It is a function by which the management is able to define the role positions, the jobs related and the co-ordination between authority and responsibility. It is a function in which the synchronization and combination of human, physical and financial resources takes place. All the three resources are important to get results. Organizing function helps in achievement of results which in fact is important for the organization. The organizing function leads the management towards the systematic and proper organization of its activities. Organization is the process of identifying and grouping of the works to be performed, defining and delegating responsibility and authority and establishing relationships for the purpose of enabling people to work most efficiently. Organizing function is effective only if the management follows the guiding principles in order to make important decisions and act upon them. The organizing function of leadership controls the overall structure of the organization. The organizational structure is the foundation in the organization. Without it the day-to-day activities of the organization becomes difficult and unsuccessful. Organizing involves designating tasks and responsibilities to employees with the specific skill sets needed to complete the tasks. Organizing also involves developing the organizational structure and chain of command within the organization. Directing function is a key management function which actuates the organizational methods to work efficiently for achievement of organizational objectives. It is considered life-spark of the organization which sets in motion the action of the employees because planning and organizing are the mere preparations for doing the work. Directing includes all those activities which are designed to encourage the employees to work effectively and efficiently. It consists of process or technique by which instructions are issued and operations are carried out as originally planned. It is that inert-personnel aspect of management function which deals directly with influencing, guiding, instructing, supervising, and motivating employees for the achievement of organizational goals. Directing is said to be the heart of management process. Planning, and organizing have got no importance if directing function is not there in the organization. Directing function has four important elements namely (i) supervision, (ii) motivation, (iii) leadership, and (iv) communication. Through this function, the management instructs, guides and oversees the performance of the employees to achieve the predetermined goals. Through the directing function, management initiates action and it is from here that the actual work starts. Directing includes human factors in it. In simple words, it can be described as providing guidance to the employees in doing their work. Directing function helps the organization since through this function management gives orders and clear working instructions to the employees so that they know exactly what is expected from them. Return from all employees are optimized if they are given concrete instructions with respect to the activities that must be carried out by them. Directing function helps management to communicate clearly with the employees and helps in motivating and encouraging them perform. Directing is always a complicated function since it involves dealing with employees of different kind. Management needs basic skills and practices for achieving success in the function of directing. Proper implementation of this function ensures the employees work effectively and efficiently and in turn helps the organization to achieve its goals. Coordinating function of the management ensures unification, integration, synchronization of the efforts of the organizational employees so as to provide unity of action in the pursuit of common goals. It is a hidden force which binds all the other functions of management. It is an orderly arrangement of employee’s efforts to provide unity of action. It is the integration of several parts into an orderly whole to achieve the purpose of understanding. Management through coordinating function achieves harmony, rhythm and unity in the individual’s efforts for the achievement of organizational goals and this is a key to the organizational success. Coordinating function is the essence of the management and is implicit and inherent in all other functions of the management. When all activities are harmonized, the organization will function better. Positive influencing of employees’ behaviour is important in this. Coordinating function therefore aims at stimulating motivation and discipline within the group dynamics. This requires clear communication and good leadership. Only through positive employee behaviour management, the intended objectives can be achieved. The coordinating function of management controls all the organizing, planning and directing activities of the organization and ensures that all the activities function together for the good of the organization. Coordinating typically takes place in meetings and other sessions with the department heads to ensure all departments are on the same wave length in terms of objectives and goals. The function of coordinating involves communication, supervision and direction by management. The function of coordinating always applies to group efforts. There is no need for coordination when only single individual is working. The need for orderliness, integration arises only when more individuals are working as different individuals come from different backgrounds, have different styles of working so there is need to unify their efforts towards the common direction. The function of coordinating always emphasises on unifying the efforts of different individuals because conflicting efforts may cause damage to the organization. The main aim of the management is to coordinate the activities and functions of all individuals to common goal. Coordinating is a non-ending function. It is a continuous function although its degree may vary. The management work continuously to achieve coordination because without coordination the organization cannot function efficiently. Coordinating is a universal function; it is required at all the levels, in all the departments and to perform all the functions due to interdependence of various activities on each other. Coordinating function is a function of the management which is to be practiced by employees working at different levels. It is needed for the coordination of the activities of the organization. Through the function of coordinating, the activities of organization avoid confusion and chaos. It brings unity and integrity to the actions of individuals in the organization and that is why it is usually the most deliberately performed function of the management. Controlling function of the management consists of seeing that everything is being carried out in accordance with the plan which has been adopted, the orders which have been given, and the principles which have been laid down. Its object is to point out mistakes in order that they may be rectified and prevented from recurring. Through this function management checks current performance against pre-determined standards contained in the plans, with a view to ensure adequate progress and satisfactory performance. Management also ensures by controlling that the organizational objectives and the plans devised to attain them are accomplished. Controlling function takes place in a four-step process namely (i) establishment of the performance standards based on organizational objectives, (ii) measurement and reporting of the actual performance, (iii) comparison of the results with performance and standards, and (iv) taking of the corrective or preventive measures as needed. Each of these steps is about solving problems in a creative manner. Controlling, is one of the important managerial functions since it helps to check the errors and to take the corrective actions so that deviations from standards are minimized and stated goals of the organization are achieved in a desired manner.